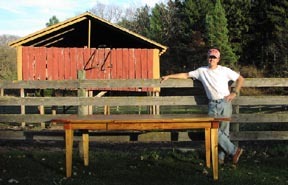 A harvest table or farm table has a long history of being the center of the home and kitchen. 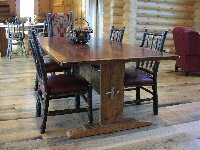 Our tables are individually designed to fit the heart and hearth of your family gathering. 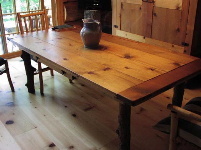 We have used 80 year old Southern Yellow pine, reclaimed Ponderosa pine, and antique weathered oak, cherry, and walnut to build traditional, solid-topped french tables ranging from 5 feet up to over 9 feet long! 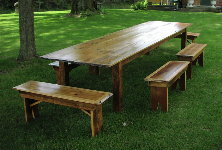 Ovals, turned legs, tapered legs, extra thick tops, and hand rubbed tung-oil finishes are only a few of the options available. Farm table benches can also be made to match. 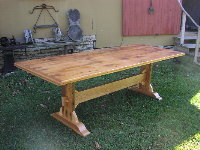 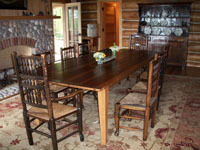 Contact us to design a unique custom antique wood, heirloom harvest table for you.